The Brother CS6000i is a great choice for those who are looking for a home sewing machine that is easy to use and has an affordable price. The Brother CS6000i sewing machine is by far one of the best buys a person can make for under $200 and sometimes even under $150 if you find a special offer. Its great combination of excellent features and low price makes it the perfect purchase for both beginners as well as more experienced users. This is the machine you would use for all those cool do-it-yourself projects that you see on Pinterest or in magazines and if you are new at sewing, this machine will allow you to familiarize yourself with this world. Undeniably, this is the main advantage offered by this machine. The fact is that there are good sewing machine in the same price range that don’t have more than 20 stitches, not to mention all the features that this machine has, so this is a great deal for your money. In fact, some of the feature that this machine has such as the Start/Stop button or the speed control slider can only be found in sewing machines that cost twice as much, so this really is an excellent choice for those looking for something qualitative and affordable at the same time. 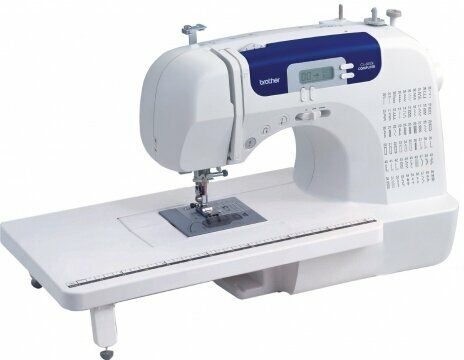 One of the main features of this sewing machine is the fact that it is so easy to use, making it one of the best sewing machines for beginners currently available on the market. This is a machine that can be easily adjusted, the settings are highly intuitive and everything can be achieved by pressing one or two buttons. In addition, this machine does not require the user to press a foot pedal because it has a start-stop button and 3 speeds to help the user go as fast or slow as needed. Having an LCD display on the sewing machine is always a plus, because it makes everything easier to understand. The display from this particular model tells you which presser foot to use, thus eliminating the guesswork and enabling you to obtain the desired results without any problems. 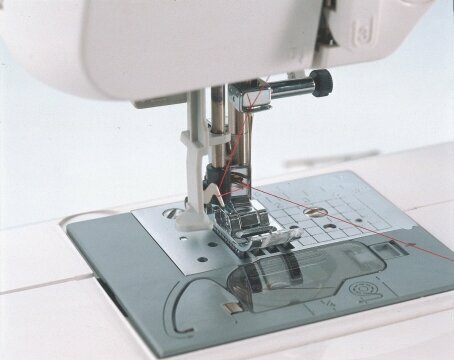 Even though advanced users may consider this as quite a low number compared to the Brother PC420PRW model, the fact is you will probably not use more than a quarter of them anyway for your regular uses, so unless you are planning to make sewing a serious hobby, you will always find the right stitch for what you need to sew around the house. 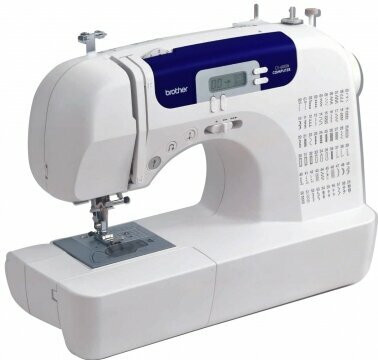 In addition, the machine has 13 pounds, which is about average for a sewing machine and considering the numerous useful features this machine has, it can be considered relatively portable. This machine is easy to maintain. You only need to feed the dogs after every use and clean the race hood once in a while. To prologue its life it is best to have it cleaned by a specialist once a year. This is how you will be able to use it for a longer time and avoid having any major problems with it in the future. Some might argue that its components are not exactly of the highest quality, but considering its price and the fact that it comes with numerous excellent features, this was to be expected. However, the fact that everything is made of plastic is what allows it to only have 13 pounds, compared to other similar machines which are considerably heavier. The problem is that when using it at very high speeds it does have the tendency to move and shake, which is why it is best to only use it at slow and medium speeds. Again, for beginners this should not be too difficult, but more advanced users might find this slightly uncomfortable. Another disadvantage is the fact that it does not function too well with heavy duty fabrics such as leather or canvas, which is why if you think you will need your sewing machine for these materials, it might be advisable to look for something else. However, for the average fabrics such as cotton, silk, satin, polyester, velvet and many others that one usually uses around the house, it should work without any problems. In addition, it will be quite difficult to use it for larger gowns or blankets, which means that quilting is not something that you can count on doing with this machine. To conclude, this is a great sewing machine, for beginners and more experienced users alike. If you don’t need to use it for many projects and you only want a sewing machine to have around the house for the common needs of your home, the Brother CS6000i is the perfect choice. This user-friendly device has everything you need to complete those household projects successfully!